Habits/Hobbies: Gambling, playing sava, bullying lessers. Languages: Drow, Drow Sign, Undercommon, Common, Elven, Abyssal, Infernal. Weapon of Choice: Intimidation, Flattery, Seduction and a Dagger in the back. With her dusky black skin often smelling of scented, imported exotic oils and perfumes and her hair always immaculately braided and adorned with jewellery, even when armoured, is it clear that this jalil pays very close attention to her appearance. When dressed casually, she prefers evocative, sensual dresses with vibrant colours to accentuate her natural curves, always copiously adorned and gilded with silver, gold, gemstones and jewellery. Even her armour seems to be an impressive suit of gilded mithral, embossed with veins of silver in the typical sharp Drow cursive artistry. Her face is chiselled and sharp, with high cheekbones accentuating her natural drow beauty. It could be surmised that she has had some kind of upper class upbringing, doing everything in her power to flaunt her natural, athletic physique to her own advantage. Initial interaction with Schezalle would reveal a female with a keen mind, sharp tongue, and occasionally intimidating demeanour to those in lesser positions, particularly non-drow whom she loves to bully whenever she gets the opportunity. She is a keen plotter and schemer, equally able to lash out with both tongue and whip with carefully placed, precise blows for her own amusement and as attempts to impress others. What is less well known is the agony she endured at the hands of her unnamed prior mistresses. Her will is shattered and much of her ability to plan effectively is drowned by inward self-pity and desires to prove her worth to whomever happens to be watching at the time. She is a risk-taker, compulsive gambler and frequently makes impulsive decisions a the spur of the moment which can backfire just as spectacularly. Schezalle does not reveal much about her past, beyond the fact that she is in Sshamath representing one Black Claws Mercantile Company, a trading house founded by Qu'ellar Baenre in Menzoberranzan with strong ties to Qu'ellar Melarn in Ched Nasad. What is clear enough to those with any cultural insight of the Drow, however, is that she clearly understands the culture, hierarchy and mindset of dark elf nobility, falling only just short of expecting the same if it were not for the fact she displays no House Emblem or Piwafwi to indicate her exact societal rank or association, besides her public acknowledgement of being a merchant for the Black Claws Mercantile. Instead, her firm and demanding demeanour almost expects respect by sheer brute force of personality and martial prowess to match her expectations, at least those who have seen it would know that. To establish a wing of the Black Claws Mercantile Company in Sshamath. Schezalle is a Lolthite so conflict in this area is more or less inevitable eventually, especially given Sshamath's political climate. Cracks have begun to form in her prior strict adherence to Lolth's dogma, however, which can be exploited by those who know how to. 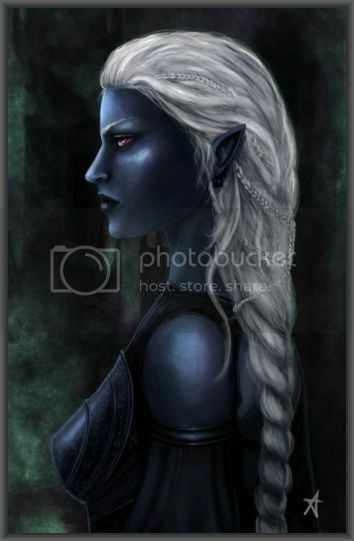 Credits: Nyssis for Biography formatting and ~Aerenwyn (Deviant Art) for the Drow Female portrait. Last edited by Tsidkenu on Mon Jun 12, 2017 6:51 pm, edited 12 times in total. [21/06/2018] - Revived character & bio for some more casual themed play. Added new Relationships! Reviewed and Approved. Please ask a DM IG for a reward. Aniarithe Zau'afin - Only having had scant interaction with the wizardess, Schezalle is somewhat baffled why the Lolthite jalil would demote herself by taking upon the profession of a faernil, a duty usually reserved for qu'ellar jaluken. The fact she seems to have allied herself with Zau'afin is of little concern to her at the moment, though, and she simply retains a cordial association with the female. Aunrae Releth - Seen as nothing more than a pitiful, weak fahliel bargaining for powers from infernal sources, Schezalle holds the harlot amongst her greatest contempt. Although she has forfeited contending with her for Nargazul's affections, she still plays the dangerous game by provoking the wannabe yath'abban at every possible opportunity. Baless Chaulssar - Content with the yathrinshee's subservient role to the Ilharess, Shez keeps herself at arm's length from the priestess of undeath if only because she doesn't like her constant lip-licking tic. She expects betrayal from the Revenancer, believing that she, like her goddess, will not be able to keep her thirst for revenge checked forever. Blackblade - Schezalle refuses to speak of the former commander of Bregan d'Aerthe ever since his passing in unknown circumstances. What part she played in his demise remains as yet unknown. Caldor Tir'en - A faern of Qu'ellar Tir'en and representative of a guild known as the Coven, Schezalle actually holds the arrogant mage in rancid contempt, although she does not show it outwardly for fear of open reprisal against her organisation and goals. She has not seen the faern around Sshamath for many cycles now and she secretly hopes he was eliminated by another house rival. Daug'aonar - Schezalle was impressed by the Bregan mercenary's combat prowess during a hunting trip to the driders of the deep caves, especially his ability to trip and immobilise their enemies to make the killing all the simpler. While not overly attracted to the jaluk's unkempt and battle-scarred facial visage, she does appreciate the male's sargtlin-like physique, ferocity and efficiency. Drathyrra - A very astute and devious faernil, Schezalle was trapped early in her arrival to Sshamath by her cunning, wit, and political machinations. Even when it was revealed that the jalil was in fact a Moondancer, Shez was left powerless to act against her without genuine fear of reprisal from the Magthere. They had many long discussions and seeds of doubt about the ultimate 'benevolence' of Lolth were first planted by these interactions. Given that she has not been seen in more than two progressions, Schezalle assumes the drowess finally fled to the surface world or was killed, and no longer cares to prove whichever is the actual case. Dugoloth - While somewhat impressed by the Ilharess of forming qu'ellar Ul'lindith's gumption and affront against the Sshamath 'situation', she remains cautious in her long term approach. Nevertheless, she is fiercely loyal to the Lolthite priestess and seems willing to obey any command from her, even to her own personal, even physical, harm. Galawyn - While initially friendly towards 'Sshamath's most famous bard', she secretly resents the jaluk's joviality, friendliness and chirp, seeing them as familiar markers of the Dancer heresy she personally witnessed in Rilae'ar'an and Drathyrra. Noting that he made quick and close allies amongst Bregan d'Aerthe, the bae'qeshel is hesitant to act against him until she has further information and an opportunistic moment. Gerfrex - Just a slave race. Nothing more to say, except that he deserves to be twice sent to the Demonweb pits for his affronts of station in the presence of the Ilharess. He is fortunate Dugoloth is more merciful than she. Imyvor Vesche - Otherwise known around Sshamath as The Conjurer, Schezalle hopes to make an important mercantile contracts with the mage. As such, she treats him with far more respect she gives to other mages she has met, not to mention her hidden attraction to his well kept and extravagant exterior, even if he is a little bit on the scrawny side for her tastes. Israe'anna - Schezalle has only had scant contact with the vicious assassin through her mercantile dealings with Qu'ellar Dev'lin and is not certain what to make of the jalil. The fact she once served Qu'ellar Zau'afin keeps Shez on her toes, expecting a betrayal at any moment from the devious female. She is unsure of Israe's actual political affiliation, and remains highly cautious for that reason. Izzrar Hunep - The dashing Bregan sleuth Schezalle had great physical attraction to, and she has been incredibly disappointed that he vanished without a trace. Jys'ssynstra Dev'lin - As with Aniarithe, Schezalle is perplexed as to why a jalil would lower her station by taking up arcane study, be it natural sorcery or not. She never really liked the faernil, seeing her as little more than a useful tool in Qil'intha's pocket for accomplishing whatever ends the matron wished. When the mage decided to turn Dev'lin to war against Sshamath, Shez's opinion of her soured further and she made no effort to intervene when she was thrown into the spider's pit and set on fire at the hands of the Conclave following the Dev'lin surrender. Kren'zar Faerzhind - Schezalle holds Kren'zar in higher regard than her previous contact with the School of Illusion & Phantasm, Mel'zar Nymrath, due to the latter's unreliability and unaccounted for disappearance. Schezalle was pleased to sell Nymrath's contracted work, the recovery of information about a fabled Castle of Illusion, to Kren'zar for a generous sum of coin. Having many illusory talents of her own, Shez is keeping all her options open and friendly about dealing with the mysterious illusionist, although the mage's recent expression of disappointment about unreliable (and now deceased) apprentices did not spur her on to volunteer for anything just yet. Lyth'raina Ssambra - Initially a target of her many vicious racist lashings, Shez has been given pause as to the half-drow's true intentions and affiliations after she were saved by the selfsame out deep in the tunnels of the underdark. Shez speaks little of the affair, knowing that she owes her life to the actions of the half-blood, a fact she clearly resents deeply. Mel'zar Nymrath - While at first pleased to forge mercantile contracts with the illustrious faern, Schezalle was only left disappointed when the contract fell through on his end due to his disappearance, despite her difficult work contracting and locating a rare tome which contained vital historical clues regarding the fabled Castle of Illusion, a place of apparent importance to the mage. She consequently resents him, and was more than happy to pawn off the contract, albeit at only a mild profit, to one of his rivals in the School of Illusion & Phantasm. Nargazul - As with Daug'on'ar, Schezalle was immediately attracted to the sarg'tlin's desirous physique at first meeting. She accompanied the weapons master on his quest to extort a masked mage, only to have the tables turned. Perceiving what she believed to be a brass dragon, she joined the fray but was unable to overcome it and retreated in a cloud of intangible vapours, abandoning the warrior to his fate. After his later resurrection in the Temple of Lolth, she got into a fight with him after he dared to grab her throat, arguably the baeqeshel's most prized possession. He later invited her to be patroness of l'Orbb Glennen, a treaty which lasted until her request for him to present Aunrae at the Altar of Lolth. Ties then severed, she had begun to prepare a special form of vengeance until Dugoloth's arrival seemingly healed the breach sundered between the two. Nym - Glad that he is mute, she keeps her drowsign conversations as few and far between with the transient figure as she possibly can. She remains uncertain of his true affiliations, but sightings of the fellow with Blackblade have eased whatever lingering tensions they shared. For now. Qil'intha Dev'lin - Originally searching for a strong qu'ellar trade tie, Schezalle found a far more desirable figure of Lolthite supremacy in the ilharess. Whatever secret accord they came to in their only private meeting remains for their ears only, although how that stands now that Lis is head of house and Dev'lin has meekly surrendered to the whim of the Conclave remains to be seen. Rilae'ar'an - Initially holding the Moondancer in the highest order of contempt, being an og'elend and all, Schezalle was given pause by the half-drow's careful political manoeuvring and alliances. While every bone in her body wanted to slay the heretical witch, her conscience remains troubled by the several influential conversations they held. She was relieved to discover that the Dancer had perished, but Ril's words linger yet in the recesses of her conscience. Only time will tell whether the Dancer's influence will bear eventual fruit, or be entirely enveloped in Schezalle's supposed dedication to the viciousness of the drow ideal. Rlyd - While their interactions have been sparse, Shez first became aware of the Enchanter when he posted a million plakla bounty for the return of the Crimson Skulls to the School of Enchantment and Charm and the capture of Jys'ssynstra Dev'lin. After a little probing it was discovered that the bounty would never be paid out, and Shez has marked the mage as untrustworthy and unreliable ever since. Ususi - The Imaskari traveller and mage is a regular target of Schezalle's bullying, whereby she delights to remind the human that she will never be a true citizen of Sshamath despite whatever affiliations she makes with the various magic schools. She only partially refrains her verbal torment when significant other mages are about, whom she does not wish to unnecessarily offend with her racist tirades against the pale-skinned wizardess. Vithsiris Hel'viviir - The only significant encounter Schezalle has made with the rebellious mage was when he attempted to cast an unauthorised teleportation within Sshamath's wards and suffered near-fatal injury as a result. Hoping to extort the male by taking him to the Temple of Lolth for treatment, Shez was only left infuriated by the vith's insolent disrespect and haughtiness. She has loathed him ever since, but fortunately she never encounters him about the marketplace. Wirg Bunegrynder - There is no doubting that Schezalle despised the fact that a slave class occupied a horrendously disgusting amount of power by being in charge of the Bregan chapter house in Sshamath. She is thus very wary of the orc's machinations and affiliations and, as much as she would like to slay him outright for usurping drow authority, she has personally witnessed the brute's ability with divine magic and is actually unsure if the creature is in fact a dragon, since she has seen him transform into such and he is accompanied by a blue wyrmling, no mean feat for a simple slave race. Zyn - A loudmouth male that should be tongueless like his twin brother, Shez has been on the receiving end of his anti-religious diatribes and snarky remarks on more than one occasion. Fortunately he is as empty as his head, so she has nothing to worry about for the moment.